With just one ingredient you can create a 100% organic and natural hair styling gel. And it will give you everything you desire – hold, texture, control, body, style, shine, and wet look. That one ingredient is flax seed, one of my favorite, which you must have known by now, as I keep singing praises for this tiny but mighty seed. 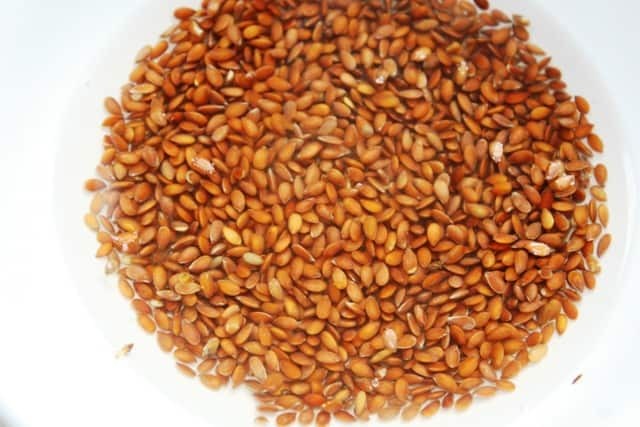 Flax seed is packed with hair nourishing nutrients such as omega 3, vitamin B1, copper, manganese, fiber, magnesium, selenium, and various amino acids. It is also rich in mucilage, which provides slip to help detangle and moisturize hair. 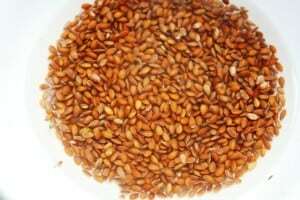 Soak the flax seeds for 6 to 8 hours or overnight. Soaking them reduces cooking time and increases gel yield. This step is optional and you can straight away start making the gel. Combine the flax seeds and water in a pan over high heat and bring to a boil. 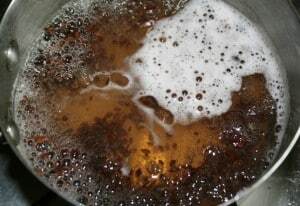 Reduce the flame and simmer for 10 – 15 minutes, stirring occasionally. The best way to check if your gel is ready is to do a spoon test. If the drip drops quickly then it needs bit more cooking. Keep a watchful eye as you don’t want the gel to get extra thick, which is not bad, just that it can be a little hard to distribute. When ready, the mixture will look thick and gelatinous. The drip should appear thick as seen in the picture below, that is when you know that it’s ready. Now turn off the heat and strain the mixture into a bowl. Once cooled, your gel is ready to use. If you want to further increase the beneficial effect of this gel you can add aloe vera gel – to enhance curls, vegetable glycerine – for extra moisturisation, and essential oils – for fragrance and their therapeutic properties. Take a small amount and rub it with your fingers or between your palms, and apply it to damp or dry hair. Use a small amount to add shine and volume, or more for a firmer hold. You can do whatever you want. This gel is great for defining curls, tame fly-aways, to create a sleek look or spiky textured look. What I love most about this gel is that it doesn’t flake. The first time I used this gel I couldn’t stop touching my hair. It was super soft, smooth, and silky. Without any preservatives this gel will keep good in the refrigerator for about a week. 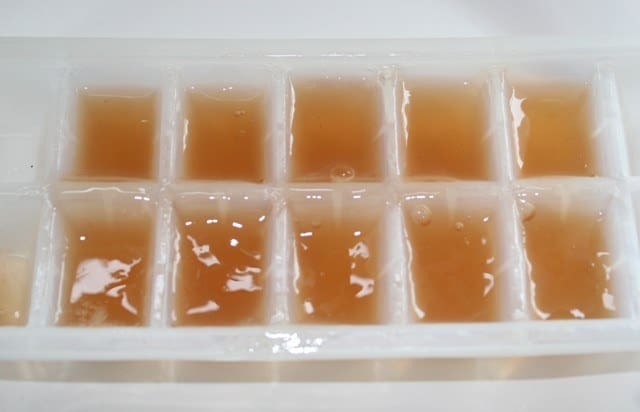 If you have extra left over or would like to make a larger batch, you can safely freeze it in ice cube trays. Suit Your Need: This recipe is very flexible and you can easily tweak to suit your needs. 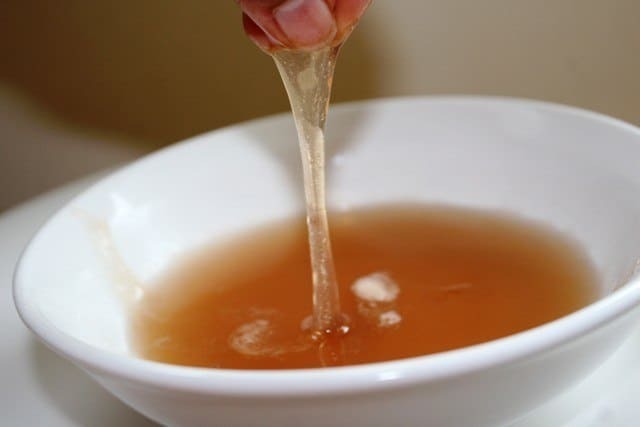 Just add more water to make a thinner lotion or more seeds, to create a thicker gel. Note: Clean your pot and strainer immediately, as it can get difficult to clean later. Have you tried flax seed gel? How was your experience with it? I don’t know if it will keep for a week without fridge. This is awesome as it is all natural. I tried once with aloe vera and melaleuca essential oil and my hair was smelling good and all soft, the only thing bad is the frizz – it gave me a lot!!! Is there anything else apart from aloe vera that I can use? Try skipping both aloe vera and tea tree oil. Use just flax seed gel. Let me know how it works for you. I have oily scalp but frizzy hair ends. Can I use this to prevent hair frizz without weighing my hair down?.Does this also help in stopping hair fall and promoting hair growth? This gel will help with frizz. If you are looking to add volume and hair growth try this or this hair mask. Works very well, thanks so much! Hi, I want to control the frizz on my thin straight hair. I have very little volume. Will this wOrk on my hair. Thanks for this nice post and tip. Thanks La Ra. This should help, give it a try. I also suggest that you try out different combination from optional ingredients and see what your hair likes. Here are some tips to add volume to your hair. Lets us know how it goes. What kind of healthy preservative could be added to this? How do I use this gel? Do I apply it to my hair and then shampoo my hair after sometime? You apply it after shampoo and leave in. 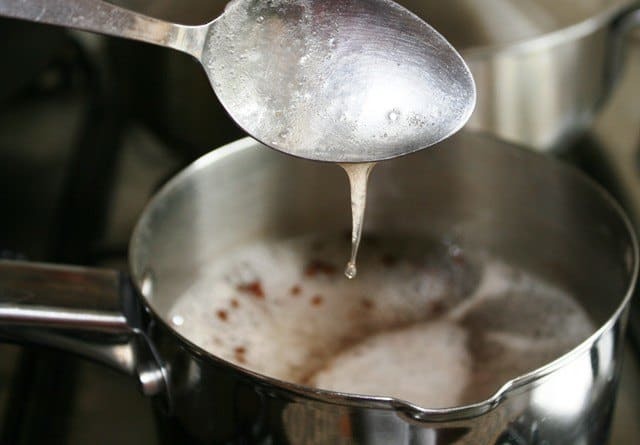 Make it a little thinner… you can also cook it after straining to evaporate the excess water. Hey 🙂 Sure I give it a try .. bt it’s awesome gel minaz… it gives a nice hold for my curly hair. For da gel I Jst added lavender eso 2 drops datz al.. nothing else.. bt da problem I faced is after making da gel I couldn’t strain it … my coffee strainer couldn’t allow da gel to drip it down…. so I directly poured in to da bottle avoiding da seeds… do u think dats iz problem minaz? I use a wide medium strainer. You can use a muslin cloth to strain, that will give wider surface area. And try making it little thinner. heyy.. after using diz gel m geting a white coat on da hair even i did scrunching part still dat white snow kind things is still on da hair… wt to do ? Rajani, I have used this gel multiple times and it does not leave any residue or flakes. Did you use any other ingredients apart from flax seeds? Aloe vera does tend to leave white flakes. Wow minaz thus one looks very easy n effective ,will definetly try .so can we use this every time we wash hair as leave in conditioner instead of oil . Hi Sonal, thanks for appreciating. Let us know how it works for you.